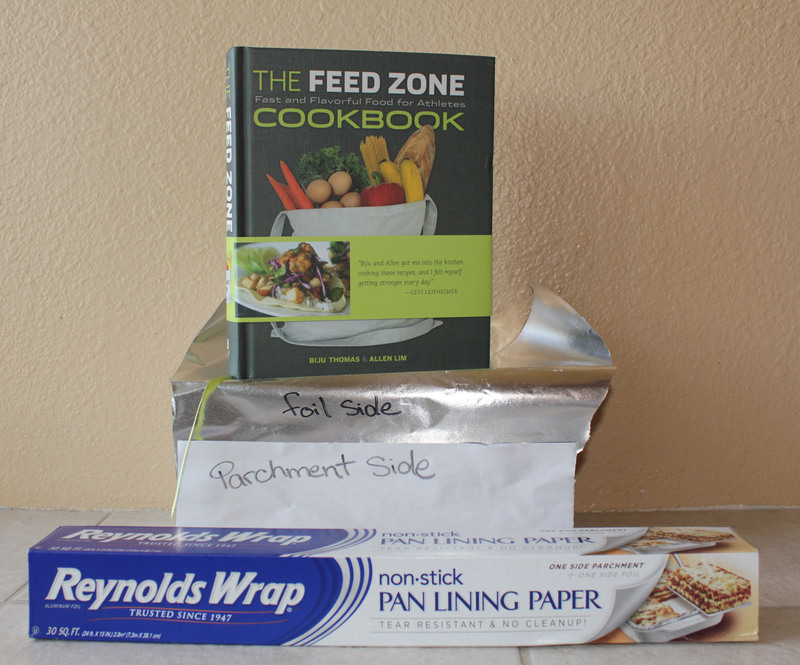 Reynolds Wrap Non-Stick Pan Lining Paper: Good for Portables? She says she’s seen it at Wal-Mart, Target, and her local grocery store and it’s easily found on Amazon, too. Have you tried it? It seems like a good fit for these fig and honey rice cakes, Allen Lim’s rice cakes, and other portable recipes. Allen and Biju like a product called “Martha Wrap Foil and Parchment,” but it seems that Patricia is onto something, too! What do you like to use to wrap your portables? Tell us in the comments. Need help with your wrapping technique? Check out this video demonstration on VeloNews.com that explains how to wrap The Feed Zone Cookbook portables. Why use this when Martha’s wrap is half the price. No reason except availability. Has Martha’s Wrap been easy for you to find in stores? Amazon has it. Got it in two days with Prime shipping! Otherwise it is not easy to find. PS-that’s also where I got the cookbook. I found this at Target for $3.59 and at my local supermarket (Publix) for $4.39. while the martha wrap is half the price of the reynolds, you pay double the price just to have it shipped. Hmm, this is the first we’ve heard of this. This site runs on a standard WordPress template and WordPress is well known for being widely supported. Sorry to hear this is happening for you! Just a note for other UK readers – Lakeland do a similar product, “Parchment lined foil” for £4.50. This isn’t something that’s widely available here, but it’s good to know we can at least get it! (unlike, say, freezer paper, which we have to import at great cost for some reason). does anyone know here i can order this kind of stuff in europe? lakeland (and amazon) won’t ship to norway. freight from the US is prohibitively expensive (read insanely expensive), and i can’t find it anywhere in Norway. I did once see it randomly in a supermarket in Finnland but stupidly didn’t buy any. The “Reynolds Wrap, non-stick Pan Lining Paper” is a wonderful product for wrapping those sticky portables as well as any sandwich/wrap which might leak some liquid. If consumers contact Reynolds Wrap through their web site, http://www.reynoldsconsumerproducts.com/, the customer service team will provide a list of stores stocking this item in their area. I have not been able to locate the Reynolds Wrap Pan Lining Paper or the Martha’s Wrap in any local store. Amazon says they are out of stock of the Martha’s Wrap (not a good sign), but I was able to order the Reynolds Wrap from Walmart. I actually wish I had ordered more in case BOTH of these products become impossible to find.